Homes on tree lined streets. Golf carts cruising by. Neighbors mingling in the town squares. Balmy nights at a concert. Sound too good to be true?…well it really is true ! Welcome to the Villages, called “Florida’s Friendliest Retirement Hometown”. From homes to healthcare, sports to shopping, recreation to restaurants, The Villages offers its residents an active adult lifestyle with numerous recreational options. The Villages is an amazing, vibrant over 55 active adult golf cart community located just 90 minutes North of Orlando in central Florida not far from Ocala. It is touted by many as America’s best and most popular retirement community. The concept of The Villages began back in the 1960’s, when Michigan businessman Harold Schwartz saw an opportunity during one of Florida’s land booms. The Florida grasslands were not only abundant but also a bargain for the times. Schwartz like other developers bought huge parcels of land with the hope of attracting Northern retirees to the lush Florida paradise. His vision came to fruition when he and his partner Al Tarrson opened a trailer park, Orange Blossom Gardens, on the present site of The Villages. Schwartz eventually bought out his partner and brought in his son Gary Morse. 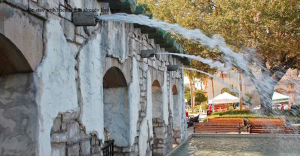 Taking the lead from other successful retirement communities like Del Webb’s Sun City, Schwartz and his son started adding amenities to the community like banks, shops and of course golf courses. Orange Blossom Gardens grew and grew until in 1992 it was renamed The Villages. The community continued and by the early 2000’s had a population of over 25,000! The rest, as they say, is history. Today The Villages has a population of over 125,000 residents. It encompasses 3 counties, mainly Sumter but also parts of Lake and Marion Counties. It boasts 50 golf courses, 2500 clubs and activities, and 3 town squares. Curious about life in the Villages? Check out the popular forum Talkofthevillages.com to see what people who live here are saying! There are several ways to evaluate whether you want to live in The Villages. There are hundreds of retail stores from arts and crafts to clothing, furniture and department stores. You can shop until you drop at chain stores like Bealls, Kohls, TJ Maxx, Edwin Watts Golf, Target and Walmart. Or just browse the many specialty shops including Turtle Bay Clothing, All Things Fine and Arden Fine Jewelry. As for dining, the choices are endless. There are so many great restaurants that even the most seasoned diner will be hard pressed to make a choice ! Applebees, Beef O’Bradys, Bonefish Grill, Carrabas, Dennys, Johnny Rockets, Outback and Red Lobster are just a few of the restaurants. There are also excellent local restaurants serving everything from seafood and Italian to Mexican and Asian cuisine. And let’s not forget Happy Hour ! Sip a drink outside by the water at The Lighthouse Point Bar & Grille or stop by Margarita Republic Grill & Bar….the name says it all…. and they have karaoke, NTN trivia and billiards. For dinner, dancing, first rate entertainment and music, Katie Belle’s Resident Club is the place to be ! It is a spectacular two-story western style club located in the Town Square. Rumor has it that even Lady Gaga performed here!! Getting around The Villages is not easy as it’s over 25 miles. Most Villagers own a golf cart as there are over 90 miles of golf cart paths which are fantastic! But, you can ask any Villager about trying to get around The Villages on the cart paths and the frustration it causes. It can become quite aggravating and confusing… just ask Glenn Beck who was down in The Villages, FL trying to drive around and you can see this comical YouTube video. Too bad for Glenn Beck that THE VILLAGES GPS was not around at that time! Before this MUST APP to own Villagers would look at paper maps that were worthless and basically drive blind. All the answers to your prayers are solved with this handy little app that you can easily download to any Google Android or Apple IOS device (including phones and Tablets). The app is a powerful GPS tool for navigating these roads, roundabouts and Golf Cart paths and is a MUST for all VILLAGERS especially if your coming to visit or going to be moving here. Not only does it have full turn by turn voice direction of all the golf cart paths in The Villages but you can use it anywhere in the United States for your car on all streets! Now you will be able to enjoy longer rides and visit places you have never been before without the worry of becoming lost. This map app also gives all the town squares, championship and executive golf courses, recreation centers, neighborhood villages, etc. The app also allows you to bookmark your favorite locations, search by address, show locations of interest such as parks, hotels, restaurants, shopping and schools. Street, Satellite, and Hybrid views are available. Many Villagers now have been able to increase travel distance by conserving golf cart battery with no wrong turns. 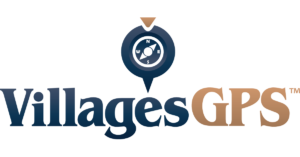 You can download this handy little gadget app in your phones app store or simply visit: VillagesGPS.com. Population of The Villages is currently over 125,000 and expected to continue to grow. Current number of rooftops is over 46,000 and rapidly approaching 56,000. New home sales continue at approximately 200 – 250 per month. There are roughly 78 different villages within The Villages and growing. Villages range in size from 100 homes to 1550 homes (Duval is the largest with 1550). The Villages property area covers 32 square miles and is growing through recent small acquisitions. There are approximately 90 miles of golf cart paths. 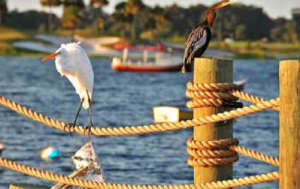 The Villages occupies parts of 3 counties in Florida (Lake, Sumter & Marion) with the majority of homes in Sumter County. Currently there are 3 town squares (Lake Sumter Landing, Spanish Springs and Brownwood) where there is live entertainment every evening 5-9pm , dancing and Happy Hours. There are 13 commercial areas (Lake Sumter Landing, Spanish Springs, La Plaza Grande, Buffalo Ridge, Colony Plaza, Southern Trace, Spanish Plaines, Rolling Acres, Mulberry Grove, Brownwood Paddock Square, Pinellas Plaza, Grand Traverse, and Lake Deaton). ALL Businesses in The Villages are Golf Cart Accessible. There are five major grocery chains (Publix, Sweet Bay/Winn Dixie, Fresh Market, WalMart Chains) that are golf cart accessible. 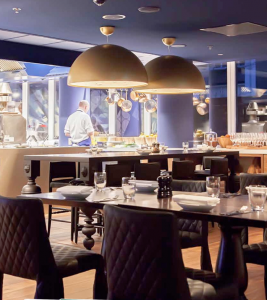 Over 100+ dining choices (not including the 12 country clubs). At build-out the population of The Villages will make it the 14th largest municipality in Florida. The Villages population is larger than 33 of the 67 counties in Florida. 80% All homes must be occupied by at least one person who is 55 years of age or older. Persons under the age of 19 years are not permitted to reside within The Villages but may visit for a maximum of 30 days per year unless an exemption is granted. 3 subdivisions are designated as “family units” and are not subject to the under-19 restriction. These subdivisions adjoin the Villages but are not part of the Villages and do not pay for nor enjoy Recreation and Amenities within the Villages. 12 Country Clubs (8 with pools – however Arnold Palmer, Bonifay, andTierra Del Sol do not have pools). 25 Family Pools (Allows Guests and children). 52 Neighborhood Pools (residents only). 10 Sports Pools (residents only). There are over 2,500 Social Clubs. There are 5 water towers in The Villages. There are over 1200 miles of water mains, 5427 miles of fresh water mains, 450 miles of waste water mains and 228 miles of irrigation water mains in The Villages. There are over 8,000 manholes in The Villages. The Villages hospital opened 16 years ago with merely 60 beds, and within years was recognized as one of the fastest growing acute care hospitals in the United States. Now the hospital contains 307 patient beds. The Villages had a partnership with USF Health (University of South Florida) that brought free screenings and a lecture series to thousands in the Villages community that dealt with critical medical issues. This partnership also led to the Villages Health project, which aimed to redefine the interaction between Villagers and their doctors and health centers. Unfortunately, USF is no longer apart of the project, but the Villages continues to strive for a more community based and patient focused health care system. In more recent years, The Villages initiated a “Marcus Welby” type planned health care network featuring an innovative approach to integrated patient care. With this approach doctor’s will take on less patients to ensure more time to focus on individual’s care. The Villages has eight fire stations. The Villages Public Safety Department has 131 employees, about 70% are trained medics and 30% are trained EMT’s. Average response time is less than 4 minutes. A new program recently launched called “Pulse Point Respond” aims to have residents within the community who are trained in CPR and willing to help in cases of emergency to be contacted if someone nearby (1/4 mile) is having cardiac arrest. Simultaneously, as a bystander is notified, emergency medical care is dispatched. As of August 2018, the survival rate for sudden cardiac arrest in The Villages Fl was 36% this is about 6 times the national average of only 6%. Contributing to this high survival rate are the many Villagers taking CPR training. The Villages currently has 192 AED groups. Falls involving injury account for about 20% of the rescue calls made by the Villages Public Safety Department many are preventable. The Villages is home to a 99,000 sq. foot VA Outpatient Clinic. The Villages hospital has Moffitt Cancer Center, a comprehensive standalone cancer center. In most of The Villages where homeowners reside, 10 of the 13 Residential Community Development Districts (CDD) develop and maintain the area. The CDD provides and maintains roads, transportation paths, storm water systems and structures, underground utilities, curbs and gutters, and street lights. The remaining three commercial CDD’s are: Village Center Community Development District -(VCCDD) Sumter Landing Community Development District, and Brownwood Community Development District. There are also two voluntary homeowners’ associations in The Villages: The Property Owners Association (POA) and The Villages Homeowners Association (VHA) with over 25,000 members. POA and VHA both work towards improving the homeowner’s experience within the Villages. The POA is more targeted towards CDD’s and addressing community issues through educational programs and more. VHA is more closely aligned with the developer and charges a two-year due of $25 to all members. Members of the VHA receive discounts at various local businesses, among other helpful services such as golf cart clinics and more. Over 12,000 people work in The Villages, or for businesses in the thriving community. 92% of students at The Villages Charter School advance to higher education. The Villages Charter School is an A rated High School with a 99% graduation rate. The Villages Charter School has over 3,000 students per year and it’s growing fast with a new Early Childhood Center. The Villages Charter School is one of the only five schools in the tri-county area to earn a “School of Excellence” award for consecutive “A” ratings and high-performance levels. The Villages operates its own Lifelong Learning College for residents. The Lifelong Learning College has on average 500 courses each semester. The Lifelong Learning College has about 18,000 residents attend around 25,000 sessions each year. The Villages adds 30 million dollars to Sumter County’s tax base. The Villages is the safest single site development in the country with the lowest crime rate. Approximately 150,000 people travel through the community each day along its busiest corridor US441/27. There are 2321 residential streets in The Villages.